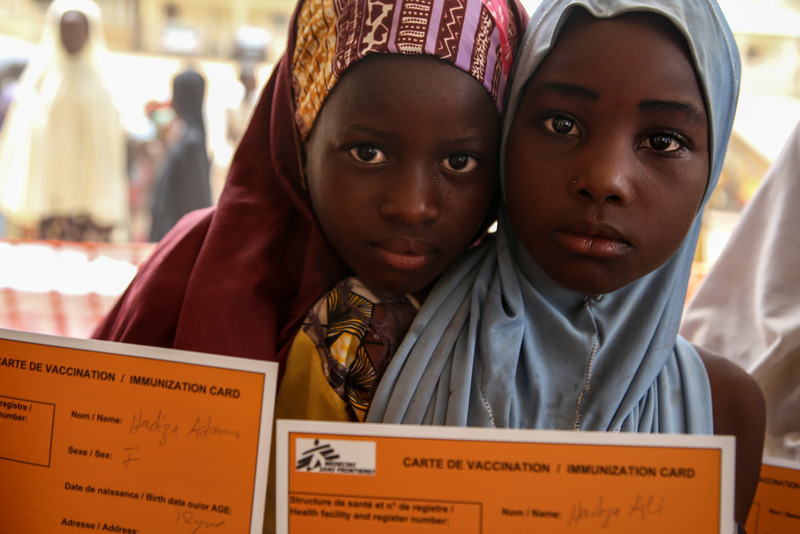 Nigeria is experiencing its largest outbreak of meningitis in nine years. According to the World Health Organisation, there were 13,943 suspected meningitis cases and 1,112 deaths between December and May. In response, Médecins Sans Frontières (MSF) is working with the Ministry of Health. We have treated 2,400 patients so far, and supported the vaccination of over 176,600 people. 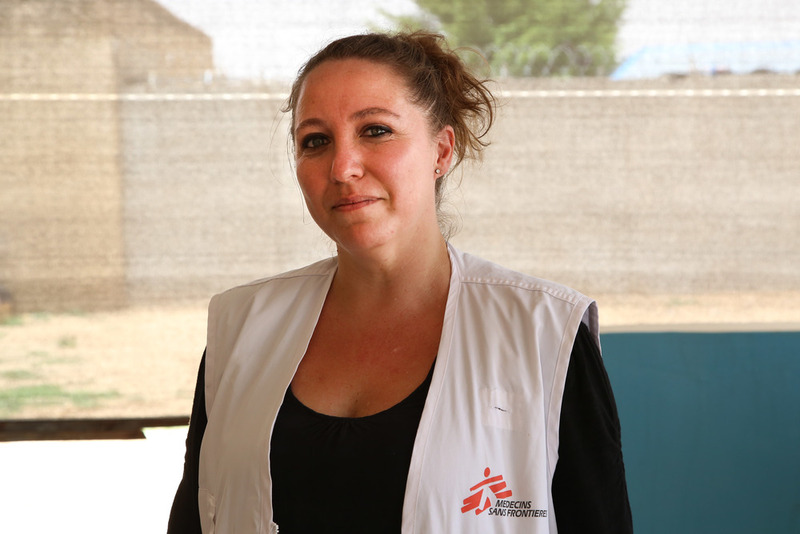 MSF logisitician Daniela Muñoz blogs from Yobe, where she describes the huge undertaking of coordinating this mass vaccination campaign. "When you organise mass vaccination campaigns, every single last detail must be controlled. 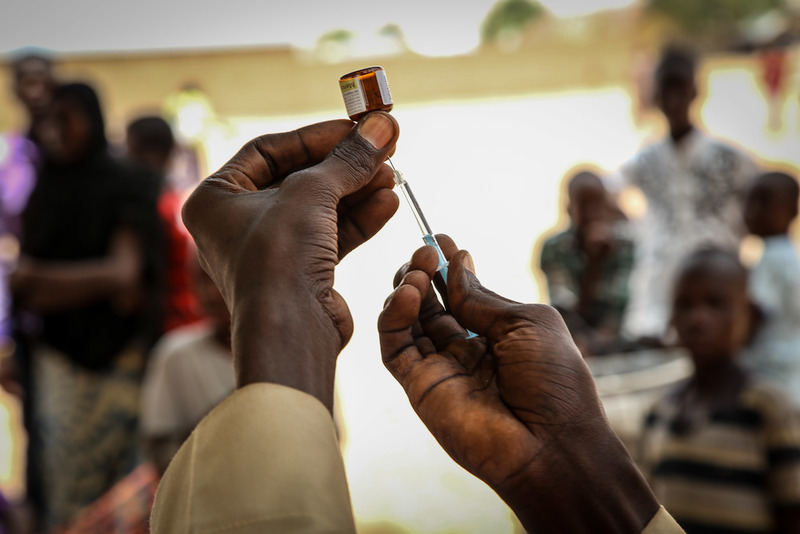 For MSF's current meningitis intervention in Yobe, this is a massive undertaking: it so far involved successfully vaccinating 136,000 people in a week, in remote areas where temperatures exceed 40°C. You even have to think about the kind of pens you'll need. The most delicate and essential part of logisitics is maintaining the cold chain. This means keeping the vaccines at a constant temperature between two and eight degrees - otherwise, the vaccination loses its full effect. From the time the vaccines leave Europe until vaccinators use them in the field, there is a long journey, in which dozens of people participate. We need to ensure the material is supervised at all times. Once the vaccines are flown into the Nigerian capital, Abuja, MSF officials organise a special reception at the customs office to prevent them from being retained for long. From there, they are transported in refrigerated trucks to a cold room at the Ministry of Health, where distribution to the bases within the state of Yobe is organised. For this trip we use portable coolers loaded with ice-packs to last for a several hour journey by road. When the vaccines reach the operational bases, they are stored in electric fridges that have been running for at least two or three days before and have a stable temperature. From there, the teams coordinate the dispatch to the districts affected by the outbreak. Often electricity is a service that is not available or is scarce in places where we launch these interventions. It implies always having generators, an electrical installation and enough space to have all this material at hand. Fuel is also required for the devices to operate 24 hours a day, which is not easy in non-urban contexts affected by crises. Choosing the right transport is not easy either. For example, air traffic to northern Nigeria is limited because MSF can only use the United Nations or Red Cross flights that arrive in Maiduguri. They are small aircrafts that only allow light cargo. This forces us to transport cargo along main roads, which are in good condition and do not present security problems. However, the same does not apply at vaccination points. Some places are more than a two hour drive from our bases and there is no other option than by car. We can’t risk walking because of the possible presence of members of Boko Haram in the area. Our logisticians have to control the movements of the cars at all times, alongside manning telecommunications by radio, mobile and satellite telephones. Beyond all the logistical aspects of handling the cold chain, searching for cars and materials, houses, mattresses and even mosquito nets, MSF's efforts would be in vain if a microplan had not been developed: a detailed mapping of all the areas where we vaccinate. We need to know how far (up to the kilometre) the destinations are from the bases, the conditions of the routes, what happens if it rains or is sunny, the number of people who live in each place and the population type. This is fundamental in Nigeria, where there are many fulanis (nomadic herding tribes). 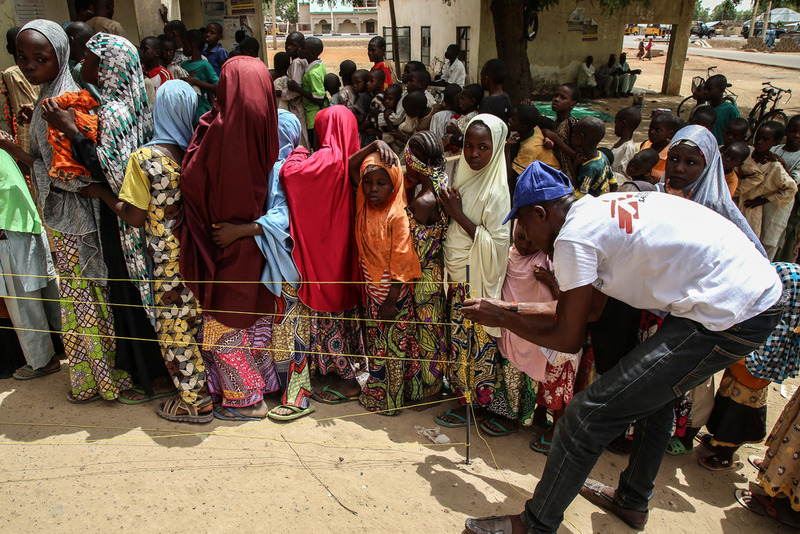 An MSF worker controls the queue of children waiting to be vaccinated against meningitis in Damaturu, northern Nigeria. Communities must be made aware of vaccinations with enough time so that as many of them can attend as possible. When it comes to meningitis, people's attendance is generally quite good because they fear the disease. However, this is not always the case. Some vaccines require a painful injection, which can deter people, making it hard to persuade them to attend the following rotations. No matter how much we control all the technical details, and no matter how much the vaccination teams are trained, unforseen events can always arise. A road closed off for hours. A warning of an attack forcing us to suspend gathering people for the vaccination. Rushing off with refrigerators without the vaccines in them. These are mistakes that can happen in a massive mobilisation involving more than 50 vehicles and teams - an intervention where you have to control up to the very last pen.